Materials - bronze, copper, stainless steel and Yorkstone. The theme is of Watford’s town twinning and the festivals common to several of the six connected towns. 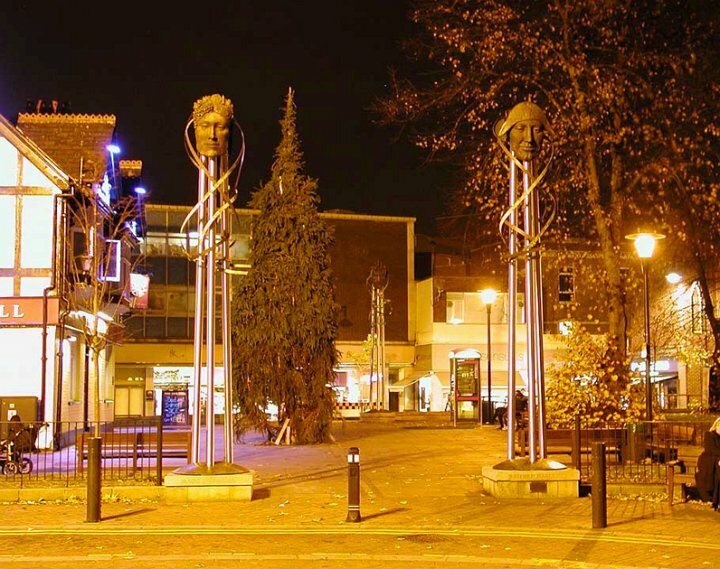 The sculpture is composed of four 6m high columns, each comprising a tower of three stainless steel tubes which support two cast bronze masks 1m high, cast by Castle Fine Arts Foundry. Wrapping round the masks and upper half of the columns are copper ribbons, some patinated green. The poles of the column pass through a domed bronze base and are fixed to a Yorkstone pier. The domed base has a relief map of the Northern Hemisphere showing the location of the twin towns, and each pier has the title of the appropriate festival (relating to the mask above it) carved into the vertical face of the Yorkstone coping.